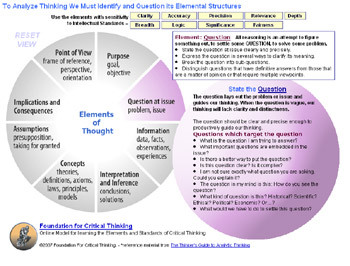 An interactive extension of the Model Above, this tool will allow you to analyze a problem by identifying each of the Elements of Thought you are using in your reasoning. Pay attention to the intellectual standards as you do so. Your analysis and conclusions can be viewed and printed in a report form when you have completed your analysis. You can save the logics of multiple problems in the database and return to review them or update them them at any time.